In this post, we will see about trie data structure in java. 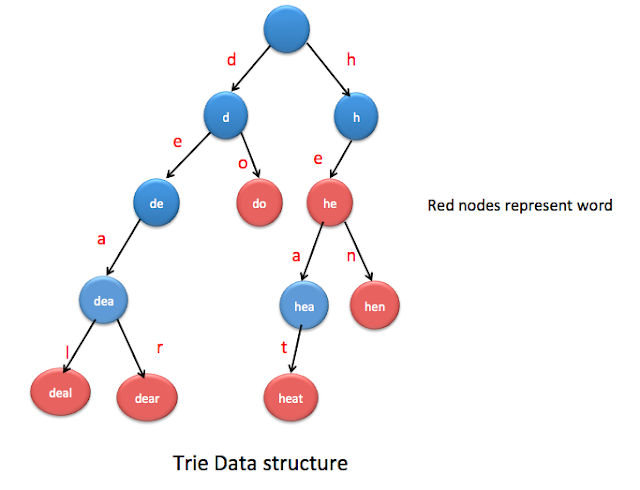 Trie is data structure which stores data in such a way that it can be retrieved faster and improve the performance. Searching contact in mobile phone book. You can insert words in trie and its children linked list will represent its child nodes and isEnd defines if it is end for the word. Lets say, you want to insert do, deal , dear , he , hen , heat etc. TrieNode will have following variables and method. Each TrieNode have access to its children if present at all. It contains current data, count , isEnd and childList. isEnd is a boolean variable which represents if current Trie node is end of word or not.childList will have list of children for that TrieNode. If word already exists, return it. Iterate over each character(lets say c) of word. If child node exists and is equal to character c then make it current node and increment the count. If child node does not exist, then create a new trie node with character c and add it to current node childList and change current node to newly created trie node. When you reach at end of the word, make isEnd = true. For each character of word , see if child node exists for it. When you reach at end of the String and current.isEnd is true then return true else return false.